We trust that you are enjoying the fall and preparing for winter as we are! Things are a little different for us; we are making plans because in just three months we will be back in Papua New Guinea! We are really excited to be heading back, but there is so much to do in the meantime. Everything seems to be tied together in one way or another. This month we are in the midst of processing paperwork, purchasing tickets, and gathering supplies to head back to Papua New Guinea. Today we took a family trip to the police station so that Melissa and I could get a thumbprint for our applications for Renewal of Existing Work Permit. This needs to get back to PNG by next Tuesday, so please pray for that! We have been able to purchase tickets from Boston to Los Angeles, and then on to Brisbane, Australia, but have not yet bought the last two flights into Papua New Guinea. For this, we need to wait for the arrival of our son near the end of this month, so please pray for this situation as well. Also, we are working to gather supplies and spare parts for various things needed to live and work there. If you're interested in helping with this, please let us know. We are also taking part in a large mission's conference this coming week, and anticipate the arrival of our son near the end of the month! These two events may intersect, and they may not. Pray for health and strength for Melissa during the last 3 weeks of her pregnancy, and that we would have clear thinking and sound judgement as we move through these events. We would like to make prayer a more central part of who we are. This year especially, I have been impressed by how important prayer is. In 1 Thessalonians 5:17 God tells us, "pray without ceasing," and we want to do just that! Prayer is our expression of trust in God, and that is to be our daily attitude. The job we are doing is God's work, and we need Him to accomplish it! In this spirit, we would like to send you updates with prayer requests every other week, but only if you are interested. Please write back to us and let us know if you would like to be on this bi-weekly prayer request list. Thank you so much for standing with us! 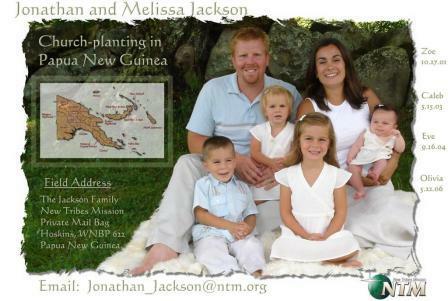 We are an extension of you as we we work to see God's work be accomplished among the Siar people of Papua New Guinea. Planes, Luggage, Hotels, Airports, and Waiting!